We would like to invite you to the ESSR Outreach Musculoskeletal Ultrasound Course. 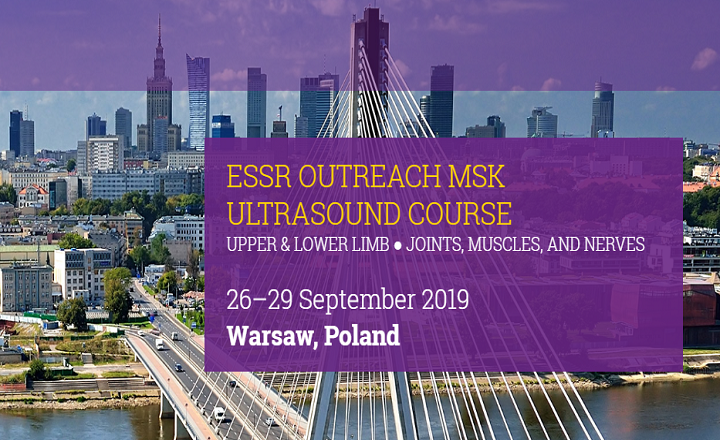 The course is organized by the European Society of Musculoskeletal Radiology and Polish Ultrasound Society.The main idea of the ESSR Outreach Programme is to advance the knowledge about the diagnosis of musculoskeletal disorders and to provide an European forum for education and research in musculoskeletal radiology. For this purpose, eminent speakers and ultrasound practitioners – members of the Ultrasound Subcommittee of the ESSR, as well as local tutors have been invited. For three days, they will teach ultrasound of various anatomical areas by delivering lectures and guiding hands-on training. The target audience includes radiologists, orthopaedic surgeons, rheumatologists, as well as all other specialists involved in MSK system imaging. We are convinced that the comprehensive agenda of the course and a considerable number of hours spent on hands-on faculties will satisfy all participants.